Protection for sensitive teeth in a mouthwash (1). (1)With twice daily rinsing after brushing with a fluoride toothpaste. Fluoride formula strengthens the teeth. Sensodyne is the No.1 dentist recommended brand for sensitive teeth. Leaves your breath feeling fresh. Alcohol Free. 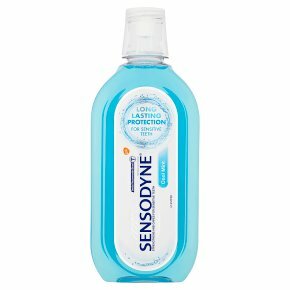 Sensodyne Cool Mint Mouthwash provides long lasting protection for sensitive teeth when used twice daily after brushing with a fluoride toothpaste. With twice daily use, it provides round the clock care for sensitive teeth. Its fluoride formula strengthens teeth and helps remineralise enamel and prevent cavities. The minty flavour leaves your breath feeling fresh and your mouth feeling clean. Always Follow the Label Directions Use twice daily after brushing with a fluoride toothpaste. Measure 10 ml and rinse for 1 minute then spit out. Do not swallow. Do not rinse with water. WARNINGS AND PRECAUTIONS<br>Keep out of reach of children. Not for use by children under 12 years of age unless on advice of a dental professional or doctor. Sensitive teeth may indicate an underlying problem that needs prompt care, if symptoms persist or worsen see your dentist. As with any other oral care products, if irritation occurs discontinue use. Do not drink from the bottle. Do not use if the seal on the cap is broken.